Septum, made up of cartilage and bone and covered by mucous membranes. The cartilage also gives support to the lower part of the nose. Ethmoid sinus: located inside the face, around the area of the bridge of the nose. This sinus is present at birth and continues to grow until puberty. 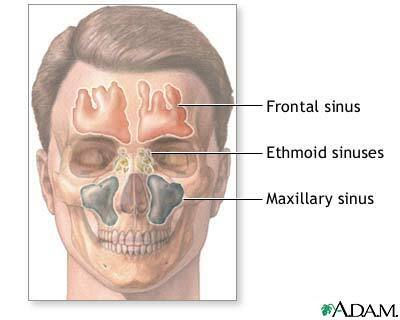 Maxillary sinus: located inside the face, around the area of the cheeks. 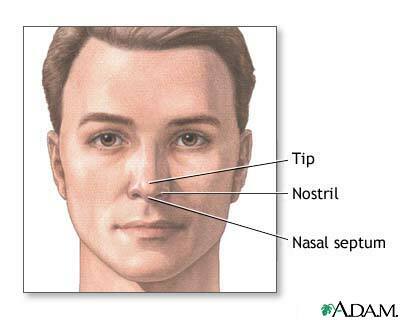 This sinus is also present at birth and continues to grow until puberty. Frontal sinus: located inside the face, in the area of the forehead. This sinus does not develop until around seven years of age. Sphenoid sinus, located deep in the face, behind the nose. This sinus does not fully develop until adolescence. Larynx: (also known as the voice box) a cylindrical grouping of cartilage, muscles, and soft tissue that contains the vocal cords. The vocal cords are the upper opening into the windpipe (trachea), the passageway to the lungs. Epiglottis: a flap of soft tissue located just above the vocal cords. 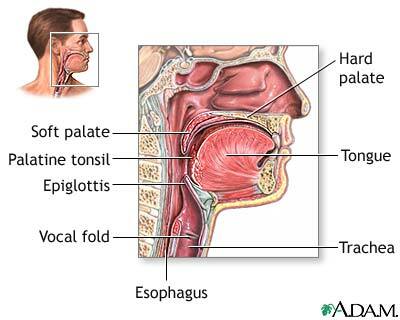 The epiglottis folds down over the vocal cords to help prevent food and irritants from entering the lungs. Tonsils and adenoids: made up of lymph tissue and located at the back of the nose and the sides of the mouth. They protect against infection, but generally have little purpose beyond childhood.